If you’ve been following along on Instagram recently, you might have already seen some sneak peeks of this project in our stories, but this final reveal will give you some insight into our design process. Our client has four kids (let me repeat that, four kids) and called us in to design her family room, breakfast area, and help with her completely gutted kitchen. We were so lucky to work with her because her aesthetic is closely in line with ours and she is super sweet. This client hired us because she knew how she wanted her home to look and feel but was unclear on how to achieve it on her own. And that’s where we come in. We understand how overwhelming it can be to make design decisions while living through a renovation, and our specialty is helping guide our clients to making decisions that are in line with their end vision. Her main pain points were: How could she tie the kitchen, breakfast area and family room together? What should the size and scale of the new furniture be? She wanted the space to feel “finished” and ready to entertain family and friends — how do you go about achieving that “finished look” without it feeling too stuffy, too glam/ formal or overdone? Not to worry… we got this. :) We created the perfect floor plan and sourced beautiful and comfortable pieces to fill the room, all tied in with the finishes chosen for the kitchen. What a beautiful space to work with! Our clients wanted their home to feel fresh, casual, and fun — but also withstand the everyday reality of all the kiddos running around. Our first thought was warm woods, lots of texture paired with a fresh white palette and sophisticated touches of black and navy. The room also had to be comfortable and durable. So all of the fabrics in this space are performance and kid-friendly. Bonus! Ahhhhh… a place to relax, breathe and entertain. 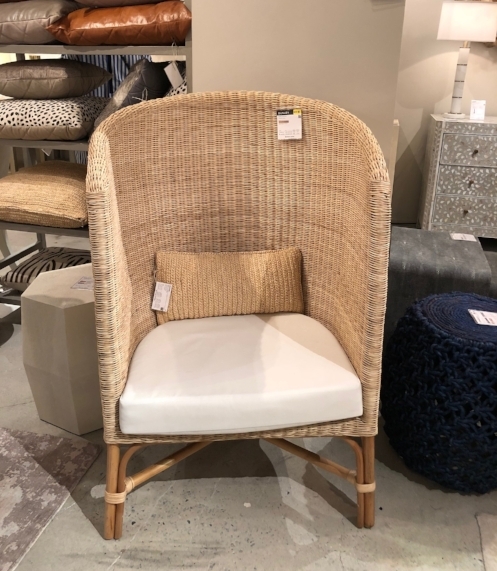 The fresh stripes on the pillows, coffee table, and the open split rattan weave of the chairs work well together to create a classic yet updated space that will stand the test of time. This styled bookshelf helps bring in more texture, warm woods and touches of green into the space. And the shiplap walls speak to our clean and fresh aesthetic. As you know, we’re big fans of fiddle leaf trees with oversized leaves. They add the perfect amount of freshness and natural color. Pattern on pattern and more texture … art coming soon! We wanted to keep the kitchen feeling cohesive with the rest of the space, while also giving it some personality of its own. Are you thinking what I’m thinking? Another two-toned kitchen success story! Okay, confession. I just can’t get enough of these chairs. And would you check out how perfect this linear lantern looks above the island? Loving the warmth of this quietly stylish brass faucet. Normally, I’d want to call this a nook, but with a gang of 4 kids… a nook, this is not. Simple but cohesive light fixtures. Gorgeous wood table and chairs. A pop of green. This space has got it all going on. Check out the coffered ceiling. Our client worked with a local custom builder to renovate the entire first floor and they added the ceiling and shiplap detail. And the result is stunning. These chairs are our jam. Since it’s an open floor plan, why don’t we take another look at the beautiful family room? Thanks so much for following along with us. We had a blast pulling it together, and it means so much to us to be able to share it with you. Be sure to subscribe to our newsletter/blog if you haven’t yet! We have some more project reveals coming your way soon. Whew, it’s been a busy couple of months here at SKD. (In your life, too, I’m willing to bet with pre-holiday craziness!) Today, I’m keeping it short but sweet with this project we completed last year for our client who owns a very successful local business but was at a total loss on how to redesign her home. Although we redesigned her whole home let’s take a look at her guest room first! Backstory. Though our client is based in PA now, she’s still deeply connected with her Midwest roots. This means hosting frequent visitors and taking her hospitality very seriously. One of her priorities was to refresh her guest bedrooms. This fabulous custom-made bed was our jumping off point. When we first met with her, she was hesitant to incorporate the pieces she already had — this bed and a vintage dresser. She asked if she should buy new, but I took one look and said no way! Both are super pretty and have GREAT lines (you’ll see the dresser in the after shot). So instead, we decided the bed’s look and pattern would be the focal point for the entire room! We layered this subtle cream and grey wallpaper, clean-lined but sumptuous bedding, and several different textures. The result? A space that’s warm and cozy, but refreshing and relaxing. We also added these modern night stands to make the room feel more eclectic. A mix of shapes, neutral tones, and organic materials creates this fresh and soothing bedside scene. 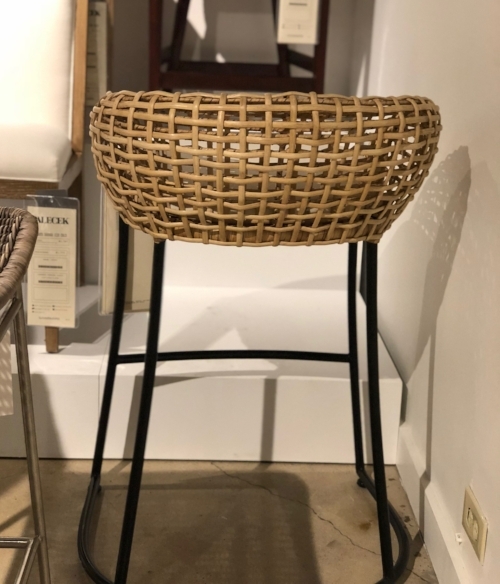 This distressed wooden chair helps unify the vintage-meets-today theme of the room. Here’s the existing dresser that I mentioned before. Gorgeous details, beautiful, warm wood. And would you take a look at those legs? And what guest room is complete without a quaint reading nook? The cozy pillow details and elegant Roman shades make this space extra inviting. In the end, our client was thrilled that we gave her existing furniture an exciting new life, and we couldn’t be happier with the results. Ahhh… wouldn’t you just love to stay here? Stay tuned for more on this Haverford project!! To see more design inspiration and an exclusive look behind the scenes of SKD, subscribe to our mailing list! Hello again, design lovers! First, if you’re reading this, THANK YOU for enduring my long absence here on the SKD blog. In case you’re wondering where in the world I’ve been, after our spring features in HGTV Magazine and Clientele Luxury Magazine — surprise, surprise — our schedule kicked into high gear! It has been a true rollercoaster ride (the good kind), and we couldn’t be more humbled and grateful for every moment, opportunity, and delightful client that has come our way. Are you drawn to two-toned kitchens? If you are, you might have noticed many beautiful photos but very little insight into how the two-toned look affects your space. And it definitely does! I’m going to show you 3 kitchens where the two tones impact the spaces differently. These should give you a good launch point for deciding which look might be best for your own home. So let’s dissect this together, shall we? Also, I just LOVE how the brass hardware plays up the warm undertone of the gray. It feels fresh, organic, and sophisticated all at the same time. We chose this gorgeous marble countertop to help keep the whole design cohesive. Its warm gray and white veins are the bridge between our two tones, helping them feel unified and pulled together. This deep navy (Mt. Etna from Sherwin Williams) and white pairing are a 180º turn from our gray-white combo, but the stark contrast is what makes it so stunning! We opted for these intriguing statement sconces. Aren’t they fabulous? Not to mention functional with focused downlight. The overdyed blue rug also helps harmonize the navy and white tones. See how it feels very balanced now? A treat for the eyes. Okay, one more feature I want to point out… like the last kitchen, we opted for touches of warm browns and brushed brass in this space, too. Without them, the cool tones would have been a little overpowering. Now, the golds and woodsy browns add the perfect dose of warmth and life! The two-tone kitchen in this 1970s beach bungalow in Avalon has an entirely different vibe going on. The second tone we chose for this kitchen isn’t a paint color at all… it’s this beautiful, warm wood table that practically steals the show. To keep the design feeling cohesive, we selected this oversized, wood bead chandelier, a khaki and beige area rug, and dark wood flooring. The collection of wooden spoons on the countertop helps, too. And there you have it! Three entirely different two-tone strategies, three (or five) uniquely beautiful kitchens. I hope you enjoyed seeing the design strategy behind each of these — and feel extra inspired now! Thanks again for following along with us, and I’ll be back soon with another post. Promise! For more inspiration and design solutions, sign up for our newsletter in the sidebar! Hi loyal readers and design fans! We've had an amazing spring over here at Stephanie Kraus Designs! Despite this gloomy spring weather we are pinching ourselves! We have been lucky enough to appear in two national magazines this spring HGTV Magazine and Clientele Luxury Magazine. You can read the full HGTV Magazine article here "The Most Summery House" (Photography by Annie Schlechter) and the Clientele Luxury magazine article here "Spring Design and Creative Spaces" (Photography by Kyle Born). Or you can just check out the pretty pictures below. Here are a few pictures from each editorial spread. HGTV Magazine... thank you to the amazing photogapher Annie Schlechter and stylist Jamie Clayton and amazing editors! Finally! We made it to the reveal! Thanks to all of you who followed along over the past six weeks, and thank you so much to Linda from the One Room Challenge for the invitation to participate! I was truly honored. And finally a big thank you to the media sponsor of The One Room Challenge, House Beautiful. I'll be honest it was quite a challenge to design a room for an 8-year old boy while everyone was watching :) Boys this age are past the cute and adorable toddler stage, and too young for a cool hip teen room! Not to mention Christopher has the smallest room in the house, with awkwardly placed window and door openings that made it hard to place furniture and still leave him room to breathe. In addition he had no interest in redesigning his room. Ha! His only request was that it should be blue. I took a little poetic license and included all of his favorite things in his room ... dogs, sports and gaming! If you want to see the before pictures you can check them out here. Let's look at Chris's room now and then we can discuss the details! What do you think? We love it! Now let's discuss the process, the details, and the decisions we made. The jumping off point for the room was this fabulous wallpaper from Milton and King. It was blue, bold and boyish. We applied the wallpaper to only one wall to keep the space from feeling too dark. Chris only has one small window in his room that faces east so it only gets sun in the morning, and I didn't want him to come home after school to a room that feels gloomy and cave-like. I wanted it to be bright and fresh - just like him! After I made the wall covering selection, I decided on this fabric from Stroheim for the headboard and bed skirt. It comes off the bolt as a vertical pattern, but I had my workroom run it horizontally to provide contrast to the vertical stripes on the wallpaper. The bed fabric not only looks great in the space but it's a crypton fabric so it's pretty much indestructible. And if you know Chris you'll know this is vital. I also loved the various blues found in the fabric and thought they paired perfectly with the wallpaper. Chris' room is super small so storage is at a premium, which is why I chose to do a custom bed skirt vs. a full custom bed with side rails and a foot board. With a bed skirt we have additional hidden storage under the bed where we put out of season clothing, pinnies (so we don't loose them) and his growing collection of sweatshirts! A custom bed skirt is a fantastic solution for a finished looking bed. A tailored bed skirt like this one doesn't shift, move or drag along the ground like most bed skirts found in retail stores. Once you go custom you can never go back. It's like a perfectly fitted little black dress! The lamp I selected from Lamps Plus had the variation in the blues that I love. We also purchased a new nightstand and dresser in a grey-washed finish with bronze pulls. The nightstand has a charging station built right in ...SOLD! I mean really ...what 8-year old boy would not be impressed with that? The washed linen bedding is from Pom-Pom at Home and it's gorgeous. It neutralizes all of the blue and white happening in this part of the room and it infuses the area with a different texture. I added a little dog pillow that I found at High Point because Chris is a huge fan of dogs. The new mattress, box spring and bed frame came from Overstock and are super comfortable! The backgammon game on the shelf of the night stand is my husband's from when he was a little boy and my kids still play with it. The books on the night stand were found in our basement hoping it may encourage Chris to read a little more at night and play a little less Fortnite. I'll let you know how that works out. Okay I'm being brutally honest here when I say this Haiku fan is my favorite part of the room because it's Chris' fave :) It's super sleek and is operated by remote control so he can control the speed of the fan at night. When specifying interior fans I rarely specify ones that contrast the ceiling color, but in this case I deliberately chose black because I wanted it to be a part of the design. The black also ties into his dresser hardware. This fan has sharp design features and brings some interest to an otherwise boring ceiling! And how about that monkey print called disco nap from Gray Malin. Chris LOVES it! I was going to put the print above his bed (in a smaller size) but I wanted to spread the cool design elements around the space. I knew the large area next to the bed would be blank and thought it was a perfect spot for my monkey. Chris can lay in bed staring at him every night. What a great way to end your day, right? This mirror is from Overstock and is super boyish and adds lots of texture in the space. It has a metal frame and hangs from a thick rope. Chris desperately needs a mirror in his room to tame his blonde curly hair so the mirror is not only decorative it serves a very important purpose. The globe has been in my basement for eons. I found the cloud book ends at West Elm and the letter sign at Pottery Barn Teen. The fabric for the roman shade is from Fabricut. You can find it here. I needed a little pattern on the window and wanted to pop the window trim with a bold blue. The open shelves are wrapped in metal and are super cool. The sailboat, lacrosse sticks, football and basketball are all ours found while shopping in our garage. The only thing that's a bit more special is the signed Villanova men's basketball which I felt needed a special stand - they are Chris' favorite basketball team, and the blue and white color matches perfectly. Bonus! That funky art piece is also from Overstock. It provides a cool focal point on that side of the room. Chris's dress shirt is hung on this navy velvet hanger from Overstock which I used to organize his whole closet! The best hangers ever -they keep his clothes straight, organized and looking stylish! This room was a lot of fun to design and it was a labor of love for my curly haired little blonde. I hope he enjoys it for years to come! Thanks again for following along with me. I hope you enjoyed this little journey. One more week to go! This will be a quick update because I am having everything installed tomorrow. Everything! Yikes. The Headboard and bed skirt were delivered today from my work room and I LOVE them! Here's a sneak peek. How can you go wrong with blue and white and stripes? You just can't. The fabric is from Stroheim and you can find it here. I met up with Wendy Concannon this week and she delivered this fabulous and cool art piece for our project.Thanks Wendy!! This mattress and box spring are coming tomorrow from Overstock and I'll be organizing his closet with these navy blue velvet hangers. OMG --I'm starting to get a little overwhelmed. And I also have a bit of a confession to make I'm not exactly sure how this is all going to turn out or where everything is going to be placed in the room. I'm going to wait until it's assembled and in the space and then move things around a bit. So you'll have to stay tuned and see how this story ends! I'll admit not much progress this week except for this fabulous art piece came from from Overstock. And it looks so good in Christopher's room. And we finished painting his room.... here's a sneak peek of the window trim painted this vibrant blue! One of the most exciting things I forgot to mention last week was a custom art piece in the works for Christopher's room. When I was at High Point a few weeks ago I stopped in Wendy Concannon's booth.to admire her beautiful photography. If you're not familiar with her work you need to head over to her website and check out her photography. She had a wall of mini proofs hanging and it stopped me in my tracks. So cool right? I just thought the size and vibrant colors would be so perfect for Chris's room. Wendy was kind enough to create a mini piece just for Chris. So he now has a custom, one of a kind art piece created just for him that he could keep forever... so special. Here's Wendy creating a mock up of the art piece at HP! That's it for now.... next week I hope to get his new Haiku fan installed, art hung and custom headboard set up and then do some accessory/storage shopping! I'm going to grab a cup of coffee and see what these talented folks are up to in week four. Why don't you join me? Here we are at week three! If you are just joining me and new here my name is Stephanie Kraus and I own a boutique residential interior design firm outside of Philadelphia. Custom design is our passion and we specialize in creating unique, bespoke interiors for our clients. In this case it is for my 8 year old son Christopher:) Not a very discerning client but completely adorable. He's the little one hugging our dog Casey. I decided to tackle Christopher's room because the layout was awful, decor outdated and storage non-existent. If you'd like to see what I'm referring to you can check out week one and week two. We have a new layout for his room in place and everything selected so we're just waiting on all of the pieces of the puzzle to arrive. So what was accomplished this week? A lot considering I was gone most of the week at High Point market. Painted the room and trim - the room was sage green before and we wanted to give it a fresh coat of white paint so the wallpaper we chose will pop and the room will feel fresh and clean. We hung this wallpaper from Milton and King - this wallpaper was chosen because of its deep blue indigo color and it's cool/hip vibe. This cobalt blue lamp came and it's even better in person! Now we not only have overhead recessed lights but we added a table lamp to spread light around the room and help my son see while reading in bed. This fun mirror from Overstock arrived and I absolutely love the texture. It will pair perfectly with the furniture and wallpaper. And I just signed for this really awesome new art piece from Gray Malin called disco nap! Perfect for my son's bedroom. Not bad for not being here. Gorgeous new lamp with night stand that has USB ports built right into the furntiure! Brilliant! We are are waiting on custom bed, custom bedskirt and custom roman shade. The keyword is custom and it will be the most dramatic part of the room. We are using this fabric from stroheim for the bed and this fabric from Fabricut for the custom roman shade. Once they arrive we will accessorize and be done! Sounds easier that it is I'm sure. This is the rest of the talented crew participating in the one room challenge and taking on much more challenging projects that I am! Don't forget to check out their links below! And we're back for week 2! Let's recap... I'm in the process of designing my son's bedroom. It is a horrific "before" you can check out the before images here from week one of the ORC. This is Christopher's new floor plan. It's a small space and because of the double door closet, entry door and window it's tough to fit a lot of furniture in here. I decided to put his bed against the wall instead of in the middle of the room to create some open space for him to sit on the floor and spread out his homework, books, etc. (I am very hopeful that is what he will use the space for). So how did I start the process of scheming for this project? Every design I create I start off with a jumping off fabric (most of the time) but in this case it was this wallpaper called City Scape by Milton and King. I LOVE it and it's perfect for my son's new space! It's modern, hip and a beautiful shade of blue. The next important decision was the fabric for the custom bed which will be the focal point of the whole space. It had to contrast the dark wallpaper and feel fresh but most importantly it had to be durable. This Stroheim fabric is from the Dana Gibson collection and is a crypton fabric called Anitbes-DG. And to confuse my work room we are turning the stripes to read horizontal. Horizontal stripes will make it look crisp, clean and very boyish. And to neutralize the bold blue I chose this soft linen bedding called Louwie flax linen from Pom-Pom Home. It's washable, casual and soft. My son will love it. In addition, I had to have this lamp from Lamps Plus. It's large in scale and simply stunning. One of my pet peeves ...dinky lamps. Don't do it. Always bigger never smaller. We also need a few staples for the space. A new full-size mattress from Overstock which you can find here and a new VERY cool fan from Haiku. You have to check out their super cool fans here. Two things that are crucial for a good night's sleep are a comfortable mattress and a great-looking fan to keep the room just the right temperature. Well, I think that's all the progress I made this week. And I'm excited and nervous how this is all going to turn out! Now if you want to see how some extremely talented people are transforming their space please check them out below! Good morning! For those of you who are new welcome to my blog! I'm so glad that you're here! My name is Stephanie Kraus and I own a boutique design firm located outside of Philadelphia, PA. We have an incredible team here that designs beautiful residential interiors and on occasion small commercial projects. I'm super excited to be participating in the one room challenge this spring! This is my fourth one room challenge and second time as a featured designer. Here are some of my past one room challenge spaces. This time around I'm thrilled to be in the company of so many talented designers and design bloggers. I'm so thankful for Linda from the One Room Challenge for the invitation and the media sponsor House Beautiful to make all of this possible for us! So what room will I be re-designing? I really thought about this long and hard. We're working on so many gorgeous projects right now but none that I could even fathom accomplishing in the next six weeks. Six weeks is an extremely tight timeline for me so any project that would require renovations would be completely out of the question. I just can't work that fast! Honestly, I don't think his room has been touched since we moved in many years ago. It started out as a nursery for my daughter with walls painted in that "I'm not finding out what I'm having so I'll paint the walls sage green" color . And we haven't paid any attention to it since then. So sad. But before you you judge me he's my third and last and a complete nomad. Meaning I don't think he spends more than five minutes a day in his room. He's always with his older brother and sister in their rooms (he even sleeps in their rooms -- yikes --I know so wrong-- but that's a whole other blog post) or he's in our basement or family room. He is NEVER in his own room. Which makes the function of the space easy for me to design. He races in a few times a day to change his clothes so when he zips in and out we want to make the room look fun, happy and free-spirited just like him! We'll need to to replace the night stand (another hand me down) and add new bedding, new window treatments, new dresser and new lighting. We'll also fit his closet with cabinetry so it will be more efficient for storing clothes, shoes and other essential hand me downs! Please join me in following along with these amazing designers and bloggers as they tackle the one room challenge... I can't wait to see what rooms they picked! Thanks for stopping by to learn all about this beautiful, fun and casual kitchen renovation we worked on last winter. Our client is a hip young physician who lives in one of the hottest neighborhoods in Philadelphia. She came to us with a cramped, dreary kitchen that was lacking storage, function, style and OMG a dishwasher!! Check out the before below.... please take note of the fridge location, electrial work, cabinet hardware and oven placement ??!!?!??!! You see I would definitely classify this as dated and frankly not user friendly at all. So we sat down with our client to see how we could help solve all of her kitchen woes. She said she wanted a fresh, bright new kitchen that was functional, comfortable and casual. Nothing too glam or modern. We agreed to stay true to the age and architecture of the home. It was actually built in the 1940's and when you enter her home the vestibule has the original mosaic tile floor and the staircase has all of the original detailed mill work. Truly amazing (sorry no pics). So here's what the kitchen looks like now! An epic improvement. We selected cabinets painted in Mt. Etna from Sherwin Williams. We added brushed brass hardware and a new porcelain apron sink. The counter tops are quartz and the floor is a pretty gray stone tile. We added new recessed lighting and sconces above the open shelves. There had only been fluorescent lighting before --eeeek! My client's contractor and friend fabricated the live edge shelves for her. So cool and right up her alley. Oh and most importantly we switched the layout around and added an 18 inch dishwasher next to the sink. We moved the fridge to the other side of the room and widened the door casing as well. There was unused space opposite the oven too narrow to add full size cabinetry so we added 15 inch wide cabinets and our client is using it as a server/buffet/coffee station. Her contractor had to remove the old radiator that was there and add a smaller one --no small feat. Those things weigh a ton. I think something suddenly came up that day and I wasn't there for that. My client actually had to go to a local salvage yard to find a radiator that would work. We also added woven blinds for warmth and texture and a fun over-dyed blue rug. There you have it small but packed with function, style and lots of personality! Thanks so much NR and KB! Such a fun project! Fall has arrived! And since the cold air is here to stay I find there are rooms in my home I tend to gravitate to that feel warm and cozy. Do you have one of those spaces in your home? With a fireplace, lots of furry throws and cozy sofas? If you follow me on Instagram you may have seen a few sneak peaks of this space last winter. Here is the picture of the library before we started. It certainly was RED and filled with Gone with the Wind type draperies! But how about that gorgeous window?? In this corner of the room we added a camel colored leather chair from LEE industries and draperies with a beautiful leading edge trim from Samuel and Son. The entire room is wrapped in a textured wallpaper from Phillip Jeffries and the trim and ceiling are painted in a coordinating paint color. We also added gorgeous sconces from the Aerin collection from Visual Comfort and a vintage rug layered over a larger textured area rug. This cozy swivel chair is covered in this fabulous antelope fabric and is also from LEE industries. Here's a great shot of the whole space ... you can get the sense of how cozy and warm this room feels! Here's a close up of that beautiful vintage rug. Can you ever have too much texture? I think not! And across the way we revamped a small vestibule area to coordinate with the library room. So what do you think? Did we give our clients a warm and cozy space infused with lots of color and personality? All photography by Kyle Borne Photography, ballet flats provided by our team member Caroline Roberts! Thanks to my team Ashley Bassett and Caroline Roberts for all of your help! Before and After - A Beach House Refresh in the OC! Don't fall over ... I'm writing another blog post. My team and I worked all winter on my good friend and client's beach house to give it a fun, beachy laid-back feel. And by team I mean my clients, my crew of Drexel U interns and Ashley my extremely talented design assistant not sure it would have turned out as fabulous if it weren't for them! Yay team! The goal for this project was to make our client's home a place where they could escape to on the weekends and hang out with friends, family and loads of cousins! It had to be beautiful and fresh as well as durable and functional for large family get-togethers! Now they hadn't updated in awhile and they needed new everything. Keep in mind this family doesn't let a lot of grass grow under their feet. They travel all the time to fun and fabulous places. But the OC in the summer is one of their favorite and most special places because it means spending quality time with their family during summer break. We updated every corner of this house including the seating and TV-watching areas. This next little nook needed some help. The chair and table were too far from the TV/fireplace and conversation area. We decided to scrap the whole chair and table thing in favor of a swing chair instead and hung it closer to the TV/conversation/seating area. We added the swing to give the kids something new to fight over... just kidding!!! But seriously it's super comfortable and the best seat in the whole house. Opposite the swing chair we added a sofa and this is where my pics get a little scarce so I'll have to write a part 2 to this post. But here's the spot before. And here's the progress shot minus the cool teak table we added. The sofa is from LEE industries and has a super fab driftwood base and crypton fabric which is the only fabric I'll specify for a house full of rowdy beach kids. The navy pillow is a custom fabric from Kravet but the fringe pillow is from Target and was bought to tie in the fringe from the window treatment. Here's a peek at the teak table we sourced. That's all I have for now! I'll be back with more pictures of this beach house! Here's a fun project our firm worked on last summer. It's a beach bungalow that was built in the early 70's. This is what the kitchen and dining room looked like before. We removed the soffits, old cabinetry and appliances and purchased new cabinets and appliances. We also removed a wall on the side of the kitchen because it would make the space feel bigger and much brighter. We wanted to add more natural light to the space so we replaced this window with a sliding glass door. We also added new flooring removed the paneling and replaced it with drywall. Now that I think about it... it was a pretty big job. Ha! Here is the after again! Here is the entire back wall. And don't worry area rug and white slip covered chairs are indoor/outdoor. This house was designed and decorated for FUN and summer memories! And here is the living area opposite the kitchen with adorable Casey enjoying the dog days of summer! Thanks for reading! P.S.This whole renovation was designed by moi and was very stressful but lots of fun!! :) All Photography by Kyle Borne Photography. So....we are making some serious progress at our Villanova project. Our goal was to reinvent a rarely used study into a fabulous library for adults to gather, converse and have cocktails. We have a Category 5 "redrum" situation to borrow a line from the scary boy in the Shining. It's not that I don't like red I LOVE red --- just not this red. I've used red here and loved how it popped the whole entry. And let's not overlook the Gone With the Wind draperies -- beautifully executed at the time but just outdated for my young hip family. And WOW!!! How about that window?!!! They just don't make them like this anymore! We'll be adding beautiful draperies to frame this floor to ceiling window and sconces from the Aerin collection by Visual Comfort on either side of the window. Next up... this fabulous sleek chair covered in an antelope fabric from Lee Industries. And take a gander at what's happening across the hall! A gorgeous office space for my beautiful and stylish client. Come back soon to see the lighting and carpet choices... can't wait to show you! I'm writing this on a foggy, dreary Sunday morning wondering why my ancestors didn't settle somewhere sunny, bright and warm all year round. Have you ever wondered that? I once took a trip to Ellis Island with my son's school and found the ship's manifest of my great grandfather (Umberto) who was the FIRST passenger listed on the ships beautifully hand-written manifest (I picture him aggressively elbowing his way to the front of the line:). It said he was 17 years of age and had $11 in his pocket. It also stated he was coming to America to visit his cousins in Philadelphia. So back to biz my friends. We just received delivery of this gorgeous table which the whole entrance to a beach house will be based on. It really speaks to the old saying buy what you love and it will always work. This is the perfect example of that. We love selecting pieces like this and then building an entire room around it. It's our job to select the star of the room and know what to pair it with. That's where clients get stuck and where we can really help them. We're always striving for our rooms to feel unique to the family and not feel like the retail chain, big box store or boutique store. We love picking pieces that reflect client's taste in this case it's a young vibrant and super fun couple. Ashley, Taylor (my new team) and I are getting ready to photograph this room. It's a large dining room with a custom marble table, Robert Abbey bling chandelier, Phillip Jeffries wall covering and upholstered chairs. 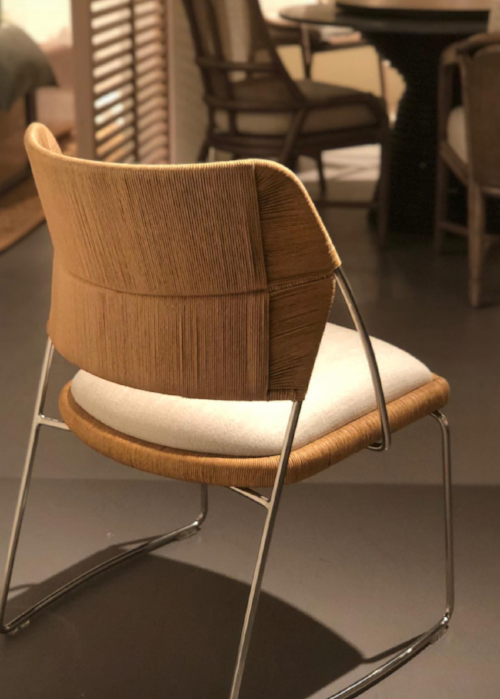 Here's a tip -- if you want to make your dining room more functional use upholstered chairs in a contract fabric like we did here. Make sure they're comfortable and durable if you have kids. I find if your chairs are comfortable to sit in you will use the dining room more for homework, work, paying bills, etc. I like my rooms usable and not museum-like! I hate having rooms no one uses don't you? Love these chairs by the way they are Italian and they are vintage (Umberto would be proud). When clients sign on to work with my firm we have them send inspiration pictures and images. In this client's case, there was one common thread throughout all of their images which was --high contrast elements. Black and white/navy and white, etc. so we incorporated high contrast elements in our design plan. Here's an example of that ... white cabinetry paired with back tile. We're adding custom mirrors in a black frame to tie in the floor. And super cool sconces in aged iron from Currey and Co. We're debating on shutters vs. woven blinds (my fave- they will add texture and a hint of color) So stay tuned. A great exercise before beginning any design/decorating plan is to look at items you have pinned or rooms you love and see if there is a common theme... I bet there is:) So when your purchasing items for your space keep those common elements top of mind. I had a few minutes to look back at some of the photos on my phone and thought it might be fun to share some of the projects I've been working on. I've been up to my eyeballs in full renovation projects but I've had so many fun decorating projects I worked on over the past few months. As I was looking through my pictures one thing struck me --- every photo I took represents hundreds of details, decisions and man hours behind the scenes to achieve a specific look--no matter the size or scope of the project or room. For every pretty picture you see remember it can take a village of people, an army of tradesman and hours of contemplating by a designer to get the room to look just right. An effortless look does not come without lots of effort! Anyway here are a few little gems I found on my phone! This client has a very busy family life both working physicians with 3 small children and they wanted a fun, bright entry. I knew it was going to be a little out of their comfort zone but I recommended a durable vinyl wallpaper (just imagining the kids running their hands along the wall as they run up and down the stairs). Fun, bright and cheery wouldn't you say? We installed a bold wallpaper and kept the stair runner as a quiet back drop to the wallcovering. Here's a peek of a kitchen renovation... gray and white cabinetry with brass hardware and a beautiful marble counter top happening over in Bryn Mawr. Awesome, right? and yep....I need new sneakers!